When you love cats they come to you. They quickly learn to settle in because they know you understand them. When you love cats they leave people who don’t truly understand them and they find their way to you. Some cats come to you even when they are well cared for. Even when the cat’s owner likes animals and is sympathetic towards cats. Some cats just want to travel. They want to behave like their wild cat ancestors. The domestic cat can have a territorial range of a two square miles and more if given the freedom. In London, UK that freedom can prove to be fatal. When they come to you they are uncertain about the place they have come to. But they know they are alright because the person who lives there understands cats. When you love cats you are a magnet for cats who are unloved. These cats don’t even need to be loved. They just get the message that you are safe. They sense when they are loved or at least accepted and at home. They are smart in that way. Today I met a cat. A beautiful, large, grey cat called Suzi. I have never met him before. I found out that is a Dubai domestic cat. His owner brought him back from the Middle East. This map shows Dubai. He came to my home, ate some food, explored the place and settled down on my armchair. Here is a picture of him snoozing on my armchair, a chair that my cat, Charlie uses so it smelled of Charlie. Suzi is fine, but what about me and Charlie? Well, I kept Charlie in the bedroom. I feel bad about that to be honest. Why should he b stuck there just because I can’t say no to a stray cat that walks in? Suzi looks purebred by the way but I found it that he wasn’t. He has a tag and I phoned his human companion and left a message. It wasn’t easy to read the tag on the collar because the phone number is a mobile number. When a cat moves all the time and the phone number is long it is hard to read. Well, Suzi’s human companion returned the call. We had a nice chat and she came down about a hour later and picked up her cat. She lives in decent part of London. However, Suzi travels over a very large area of about 1 mile x 1 mile = 2 square miles. There are lots of busy roads in that area and plenty of dangers. Rehome him with someone who can do better (very unlikely because this cat is demanding). The unusual solution of a leash seems the best choice in this instance. That is an almost extreme solution and I don’t know if Suzi’s owner will be able to carry it off. I gave her the name of this website. Perhaps she will leave a comment. What do you do when you love cats and cats love you? How do you accommodate all the cats? How do you manage to accommodate the cat that you look after? You must give priority to the first cat. But is that right? This is how cat hoarding starts. I’ll never be a cat hoarder. I am far to pragmatic and organised. But I have the potential. Elisa Black-Taylor has the potential. The problem is this: even in the green and pleasant land that is England there are many cats who are looking for an ideal home. There really is a problem with finding good homes for cats no matter where you are. There are not enough people who are really qualified to care for a domestic cat to a standard that satisfies the cat. Either that or the domestic cat is sometimes still unsuited to be domesticated. This entry was posted in Cat Behavior, Human to cat relationship, Michael Broad, Stray Cats and tagged befriending a stray cat, cat behavior, human to cat relationship by Michael Broad. Bookmark the permalink. Some cats just cannot be contained. My Marvin is a good example. He has lived all of his probably 9 years outside, doing whatever he wants to do. He has a large territory and has a good fear of vehicles. I just have to believe he knows best. He has survived this long. Even though he is spending more and more time in the house, he doesn’t want to be inside all the time. He will not settle down in the house unless the door is opened just wide enough for him to get out. He will nap inside if the door is opened. He has a very loud voice that will not be ignored. I just don’t think I will ever contain him. I really don’t want to either. We can only hope that Suzi is a wise cat and will stay out of trouble. He’s been through a lot. The part of the story I love the most is how he found Michael. In another post somewhere we talked about how cats read ‘vibration’ for lack of a better word. It reminds me of a little old lady cat who I found curled up on my porch last year. I had never seen her before. When I lifted her up I could see she was very old. Probably mostly blind. She seemed confused. I bundled her up, set a spot for her in the garage with everything she needed. She ate and seemed comfortable. It didn’t take long to find her owner. Asking around, I learned there was a sign up at the school for a missing cat. The family seemed desperate to find the little cat. They described her as senile and geriatric. She had been missing for 2 rainy cold nights and lived easily a half mile from my house round many corners and streets. How she found my cat loving house is a mystery. Worse, how an indoor cat got out was the mystery. All is well that ends well. I hope Suzi comes calling again Michael, but very carefully. Marvin is like Suzi as you say. They have the same mentality. They won’t be confined as you say. They don’t fit in very well into the modern world if we are honest. Suzi settled in as if he was at home. Cats have a very acute sense of differentiating friend from foe. They know immediately and instinctively who is safe. The home in on the safe houses. It may seem like Suzi is one of the lucky ones, having a home and a caretaker, but if he gets killed on the road he’s worse off than the cats at The Cat Network. They live in a shelter, but it’s no kill, they get out of their cages every day (unless quarantined for some reason), humans come and pet them and fawn over them, they have many toys, perches and scratching/climbing posts, and most of all, they are kept safe from traffic. So in reality, if Suzi gets hit by a car (and given the territory it may be inevitable) he’s worse off than the shelter cats. I’d love to let Monty have unlimited, unsupervised outside time, but dangers of wildlife, traffic, his inability to get out of trees, and the possibility of mean people who might hurt him all combine to require that his outdoor activities be more limited. Any responsible cat caretaker would come to the same conclusion. It’s not that you never can have free roaming cats, but you have to consider the dangers to the cat. By the way – with all my cats I make a point of giving them a tag where the phone number can be easily read without having to get too close. Its important since your cat may not want to be touched. Clear black numbers on a white large tag which is facing forwards. A reflective collar. This little bit of engineering is key. This is nuts – I would be very frightened for Suzi. I’d be worried about him dying any minute. I agree with Mayen – think of the quarantine ans all Suzi went through just to possibly end up being run over. Can she enclose her garden (rather than build a catio)? This would be most ideal indeed. I’m sure he’ll be back and I wouldn’t blame you one bit for letting him in again. I met a cat today – he’s a grown boy now and was a kitten this summer. He is like Red was – exploring and wandering. I am worried about him too but I know he lives just a few doors down. Its hard not to worry. For me because of how things ended with Red. I had a dream last night I was trying to find Red and I was searching and searching – it was awful. I felt in my dream I had abandoned him and was now trying to get him back. I woke up a complete mess but relieved that I had not abandoned him the way it seemed in my dream. But maybe by allowing him out I did. He couldn’t live indoors only though, I tried things. Its a hard hard situation. It’s very sad when a cat dies on the roads and I really hope Suzi will be safe. Hello Michael. I find it strange that Suzi’s cat carer went to great lengths in order to take him to england from far away dubai- consider the airfare, shots, quarantine etc.- only to react so indifferently to his dangerous outdoor adventures. You are right, this cat will die on the road eventually. It is an alarming situation. Suzi is a pet cat and he needs to be cared for and his plan of care should include reasonably controlled outdoor activities. He may be used to being a free roaming cat and there might be a place for such, but it sounds like Central London is definitely not. The unusual solution of a leash seems to be the best solution for this instance and really needs to be carried out asap, it may be almost extreme but it is better than nothing. I earnestly wish him the best. He is a strikingly beautiful and mysterious looking cat. His unexpected visit must have enthralled you. With his beauty complemented by his bold and relaxed disposition, if he visited me I would have been so enthralled. He undoubtedly chose your home because he has a natural affinity with you. I am sure he will not forget you. I hope your charlie has recovered from the brief strain d/t your unexpected visitor. I think you came up with the perfect solutions. I don’t think I can add much to that but I will comment. I know that she isn’t into some of the things you’ve suggested but I would encourage her to reconsider. Keeping the cat inside is important because there are all kinds of dangers outside such as moving cars, dogs, mean people, cat fights, physical injury, parasite infestation, disease, getting lost, getting abducted, and getting killed. I would also add: deadly toxins such as anti-freeze. I hope that list is convincing. Some people say they let their cat outside because they love the cat. I say I keep my cat INSIDE because I love the cat. Building a Catio would be a great idea. Then the cat would be out in the fresh air without being in danger. Since she’s a gardener, she might enjoy putting some pots with some edible cat plants in there such as cat grass, catnip, spider plants, etc…She could also put a cat bed or cat tree in there as well. That would make it his own little cat world. If the Catio is out of the question, then create a nice playground inside complete with a lot of cat toys and cat furniture. He could also be walked on a leash (harness included so he won’t choke). She cares about him enough to pick him up from your house when you called but I get the feeling that he feels kind of neglected. Some people don’t realize just how much attention and daily care a cat really needs. If she puts him up for adoption, she should mention his daily habits and that he is demanding. She shouldn’t let anyone be surprised with the way he really is or they might give him up to a shelter if they don’t like it. Some people are willing to take in a cat who likes a lot of exercise and who is demanding. As an aside – I think he needed your company, Michael. He needs a good friend. Thanks Liz. I wondered whether he just needs a really good friend and some attention as you say. Suzi is a bit alpha male and he likes doing his own thing but I tend to agree that he might not be so eager to go walkabout if he has someone to give him lots of attention. I don’t know the exact situation. At least the owner came down and met me. The owner actually may read this because I told her the website’s name. If so please leave a comment. 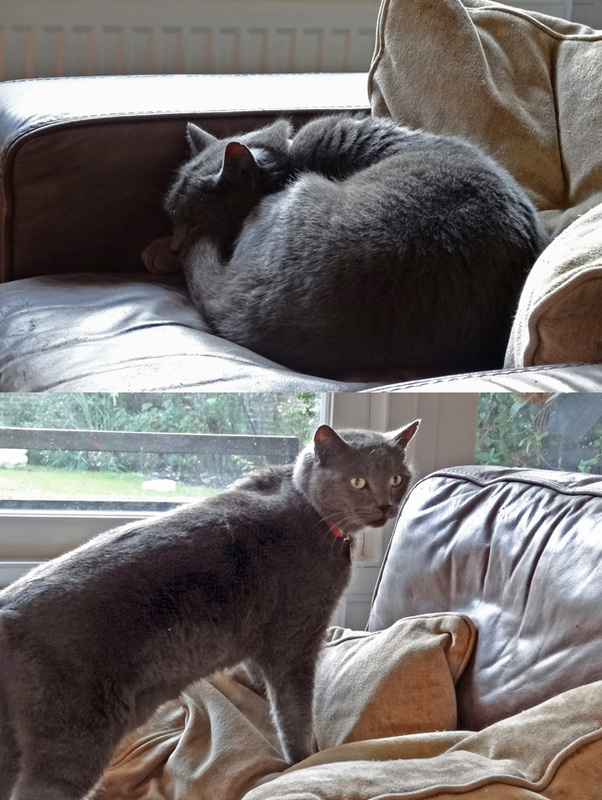 Suzi is a beautiful, large grey cat with a dense, very even coat. He looks like a purebred but is a moggie from Dubai. Maybe he is purebred but not registered as a purebred, pedigree cat. I think he likes heat. He put his head against the radiator which was hot. He settled in very fast. It was if he belonged here. He met my Charlie. They had a stand-off yowling at each other. I had to gently move Suzi into another room to stop it. Although being English I am not in favour of keeping cats indoors, in this case something like that has to happen. If you were down here, you’d be shocked at how busy the roads are and Suzi has to cross some them to get to me. There is no way he can keep on doing that and survive. It’s a worry to me that he may come back Michael. He liked that comfy chair, and the warmth. I’m sure he sensed a love of cats. He was welcomed, yowling Charlie or not. I’m not an animal behaviorist by any stretch, but I observe them and enjoy figuring them out. Marvin, my handsome hunk of a red tabby, gets into it with Shadow the backyard time share-boyfriend of Yellow cat. I’m always worried they will duke it out. Marvin is the king of the front yard. But when Marvin is inside the house, Bigfoot comes downstairs hearing Marvin is here, they talk to each other, have a good long sniff of each others noses, Marvin tries to head-bump Bigfoot who isn’t sure what to do with that. Bigfoot retreats to his upstairs castle and that is that. It is not like they want to hang out and tell stories. There is no telling why cats have instant rapport with some cats and not others. They know, but they aren’t talking. Nice cat adventure Michael. He is a beauty. He rubs against me as if he knows me. He plonked down on my chair and snoozed as if he has been here for years. He is a beauty. In character he is a bit like Marvin. Bold and relaxed. Apparently he has got into cars before. He has no idea who is driving it though 😉 He also went to the local railway station, which must be about a mile from his home. Weird. If I was the owner I’d be terrified and would not allow it. She told me that on one occasion he disappeared for two weeks. This is Central London for God’s sake. She is not concerned enough really. She won’t build a catio or really take bold and much needed steps to protect this cat. Disappointing. I understand and am not being critical of her but I’d hate this cat to die on the road. And he will. He is 6 years old. He is pure Middle Eastern. And Arab cat. I spent some time petting one of Monty’s half siblings at the no kill shelter near us the other day. I sure wanted to bring him home, give him what Monty has and provide some cat companionship for Monty. My husband said no to that idea. Perhaps he fears I will become a hoarder. But Monty’s not very snuggly and this cat is. Monty is semi-feral whereas this cat was socialized since he was a few weeks old. To me it would be nice to have a cat that would cuddle up to my husband the way he wishes Monty would. Maybe the other cat being more accepting of humans would have a positive influence on Monty in that area. My husband fears they won’t get along. I feel like if we could help one more cat we should. If it were up to me I would foster the other cat to see how it would go, and if he and Monty could get along as pals I would adopt the other cat as well. But this is not going to be. Monty remains one of the lucky ones– very lucky. I wish every cat had the type of life he has.